Are all your friends in another Kingdom? Do you want to move to your friend's kingdom? There's nothing more annoying than starting a new game to find you are playing on a different server to your friends. It will also happen in Lords Mobile. Therefore, we will tell you how to move your kingdom in this article. If your Castle is under level 6, you can use a Novice Relocator to move kingdoms. You're provided with one free of charge when you start playing the game. You can instantly move to any kingdom using a novice relocator, without any restrictions. How to relocate turf to another kingdom? Make sure that you have a Novice Relocator. Tap the map button located on the bottom left to access the World Map. Tap the globe icon to access the Atlas if you want to relocate to that Kingdom. Move the screen to find an empty space, tap "Transfer" to relocate your turf to that space. Most players get past 6 level, without even thinking about which kingdom they want to play in. If they want to move to another kingdom, they have to use the [Migration Scroll] to finish that! 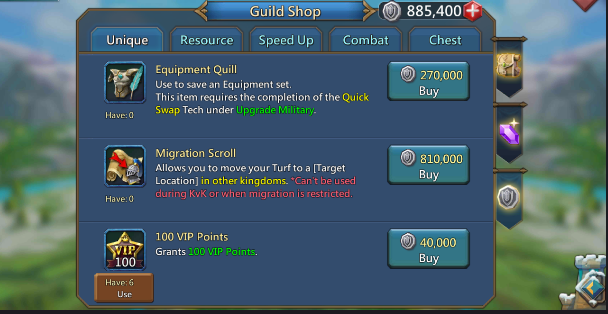 Migration Scrolls can be purchased in the guild store, but are fairly expensive at 810,000 guild coins per scroll. If the destination Kingdom is more than 90 days old, Migration is unrestricted. If the destination Kingdom is less than 90 days old but is still older than the player's current Kingdom, the player can still migrate. Migration is not allowed during Kingdom vs. Kingdom. You will lose all resources in excess of your Vault limit after migration! There is no Might restriction, but the number of Migration Scrolls required for players to migrate will depend on their projected Might Ranking in the destination Kingdom. Note: Migration may be restricted in newer Kingdoms. The player can only migrate to Kingdoms where there are no restrictions. You can use 1 Migration Scroll to move to another kingdom. But if you're in the top 50 ranking players, then the number of scrolls increases a lot. Since you're only limited to earn 40,000 guild coins a day, please save your guild coins right now! Next Next post: Lords Mobile: A New Anthem Coming Soon!